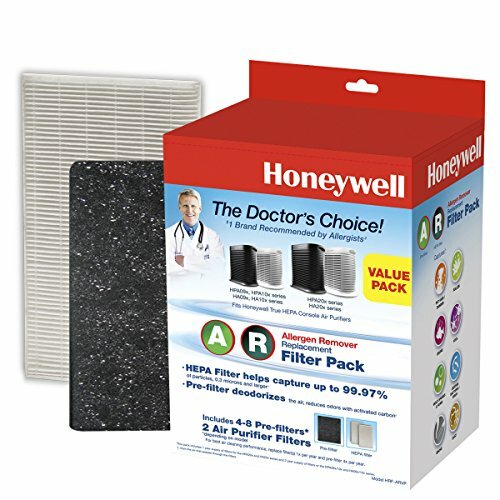 Honeywell HEPA Filter Kit includes all the filters needed for your Honeywell HEPA console (HPA200, HPA100 Series). Includes 2 Certified HEPA “R” Filters and 1 “A” Odor Reducing Carbon Pre-filter. Certified HEPA filter captures up to 99.97% of microscopic airborne particles from the air that passes through the filter as small as 0.3 microns. Activated Carbon pre-filter traps odors/VOCs and captures larger particles, such as dust and pet hair/fur before they reach the HEPA filter. Includes 2- HEPA "R" Replacement Filters & 1 "A" Universal Carbon Pre-filter.